Powertrak CPQ (Configure-Price-Quote) takes the guesswork out of configuring, quoting, and ordering products with complex wiring systems. Users will no longer have to spend time looking up or guessing what cables to buy, how many or at what length. Powertrak calculates and visually displays that for you! Note: Powertrak calculates for wiring slack but gives users the ability to increase/decrease wiring slack. 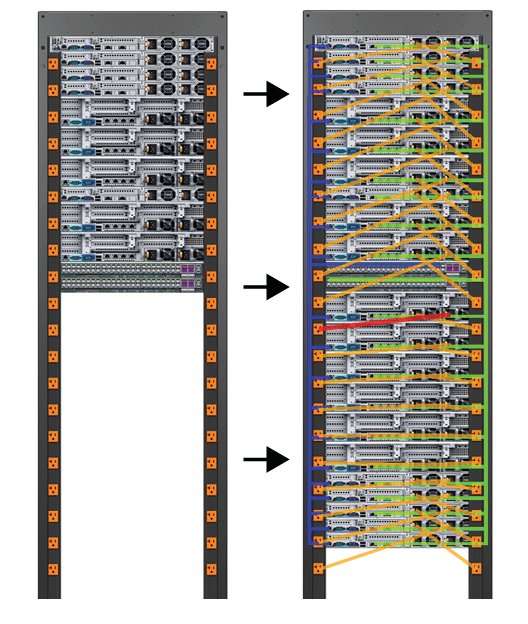 In this 2D rack configuration, users drag and drop components into the rack's frame. 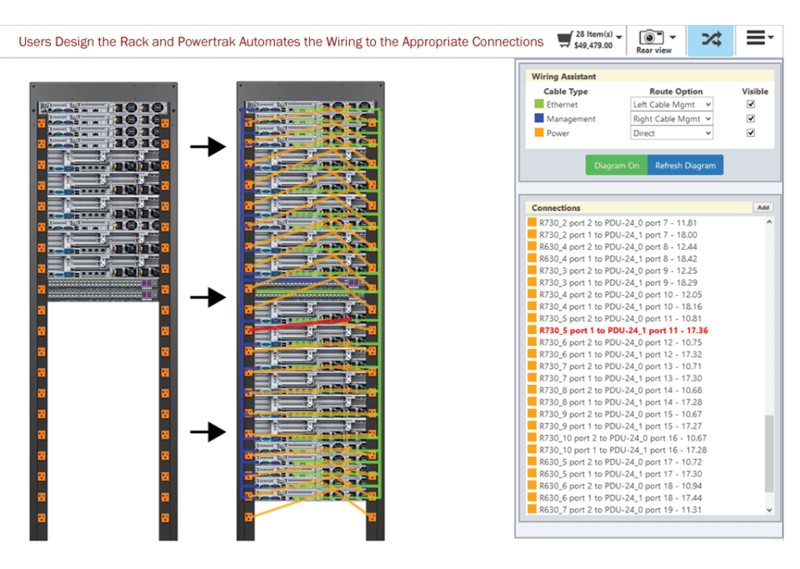 Powertrak then generates a visual rendering of the required cables (wiring harness, junction, wire, or other electrical component) and connects them to the appropriate ports and plugs. When new components are added, repositioned or removed, the wiring layout and length changes in real-time. In turn, all components and wiring types are instantly added to the shopping cart. Adjust the view to better understand and orient the diagrams of the configuration and highlight any wire or harness in a specific color to make it easier to follow the wiring from source to termination. With Powertrak, users can freely place two-dimensional configured racks into a three-dimensional server room. This feature is a hybrid of Powertrak 2D and 3D Product Configurator. 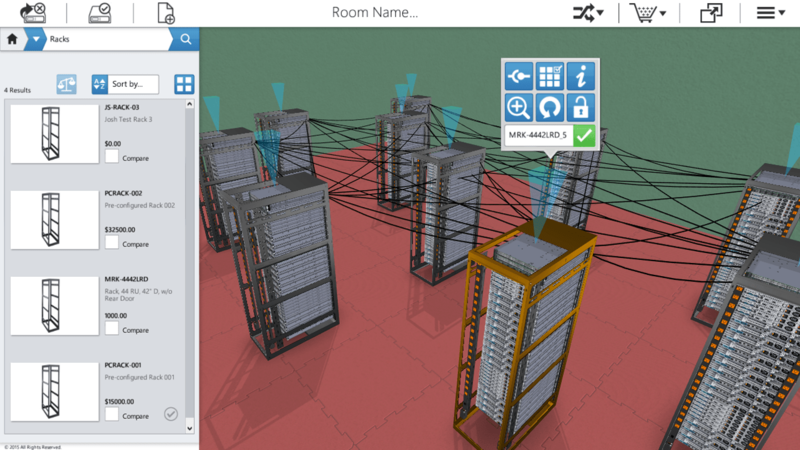 Regardless if your building 2D or 3D racks and placing it into a 3D room, the wiring length auto adjusts and dynamically recalculates from rack-to-rack as it moves around the room; enabling users to quickly determine how wiring configurations change with various layout designs. Under the Powertrak CPQ offering, the 2D/3D Product Configurators empower users to visually and interactively design make-to-order products. Dynamic Wiring and Cabling automation enhances the user experience by simplifying complex configurations and eliminating time-consuming look-ups. It's available in both Powertrak 2D Product Configurator and 3D Product Configurator. For those interested, here is a short demonstration on how Powertrak Dynamic Wiring automates wiring types and length, and visually displays layout connections - all in real-time.